Although Zelda ranks quite low on the competitive Super Smash Bros. tier list, her placement in the amiibo metagame begs to differ: her strong skill set makes her a very threatening opponent. 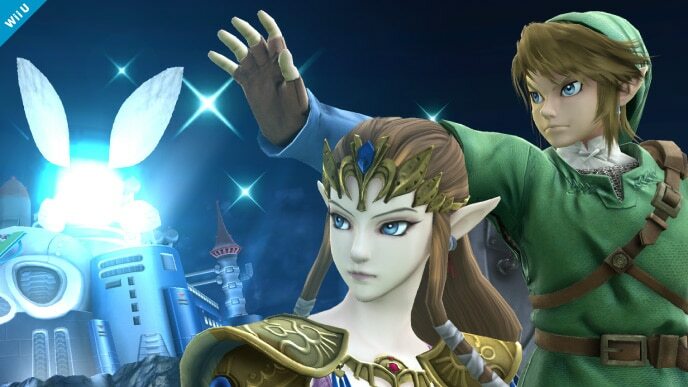 Zelda has a solid set of smash attacks: her down smash is a quick “get-off-me” move, and both her forward and up smashes hit multiple times and have lasting hitboxes. All three of these moves are also quite strong. 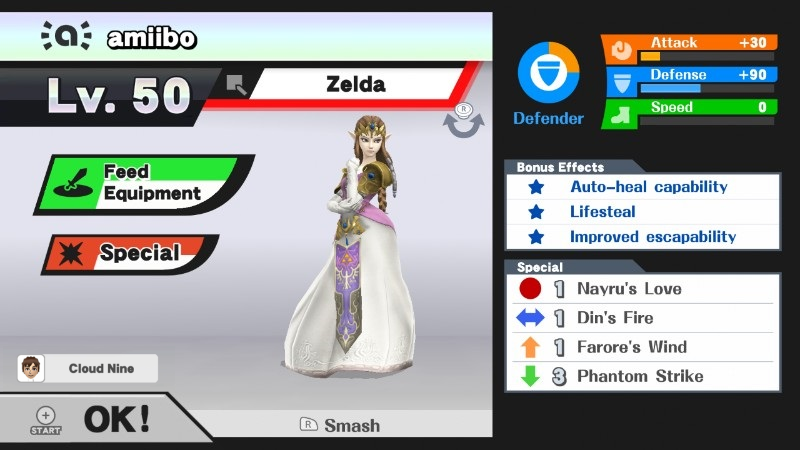 Zelda’s special moves are just as useful: she has a reflector that can also protect her from incoming attacks, an effective gimping tool in Din’s Fire, an up special that serves as a safe and efficient recovery move, and a down special that can either break shields or inflict major damage. However, Zelda is held back by several flaws. Most notable is her weight – or lack thereof. She requires serious investment into her defense stat to be able to stand a chance against opponents with a high damage output. Her smash attacks, while potent, lack range, and are sometimes whiffed entirely. Zelda also suffers from several annoying tendencies in her AI. She has a habit of spamming her up smash, down smash, forward aerial, and back aerial if these attacks are used against her too often during training. She may also randomly teleport upwards with her up special, Farore’s Wind, while still on-stage. This leaves her open to punishment. Zelda’s strengths outweigh her weaknesses, and overall, she is a rewarding amiibo to train. She does require a good bit of time and patience, but at her best, she can contend with any opponent, no matter how strong – she can even hold her own against top tier characters like Bowser and Ganondorf. Phantom Strike: This is a custom move version of Zelda’s down special. It charges faster and deals more damage and knockback, but doesn’t travel very far. 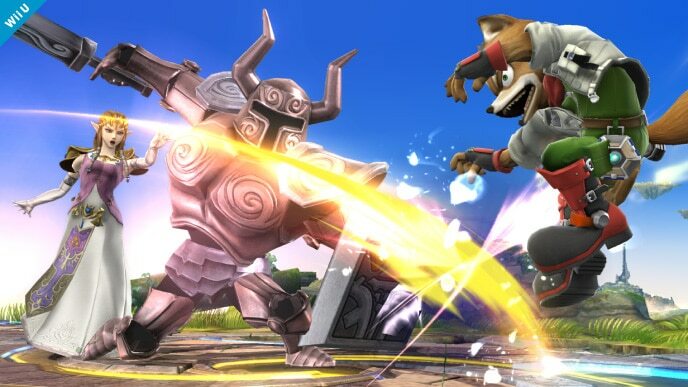 In a pinch, this move can be a lifesaver, and Zelda is capable of fully charging this attack to either deal massive damage or break an opponent’s shield. Neutral options: jab, forward tilt, and down tilt. Zelda’s jab is fast and has a respectable damage output. Her forward tilt can be angled and is strong enough to KO middleweights at 130% near the edge. Down tilt can also combo into a forward smash at low percentages. Main KO moves: forward smash and up smash. These are Zelda’s most important kill moves. They both hit multiple times and can catch opponents off guard. Of these two attacks, you should prioritize forward smash, because its range is more effective against grounded enemies. Up smash should be used solely as an aerial punish. Situational moves: Nayru’s Love, Din’s Fire, and Phantom Strike. Not only does Nayru’s Love reflect projectiles, but it’s useful as an attack, too. 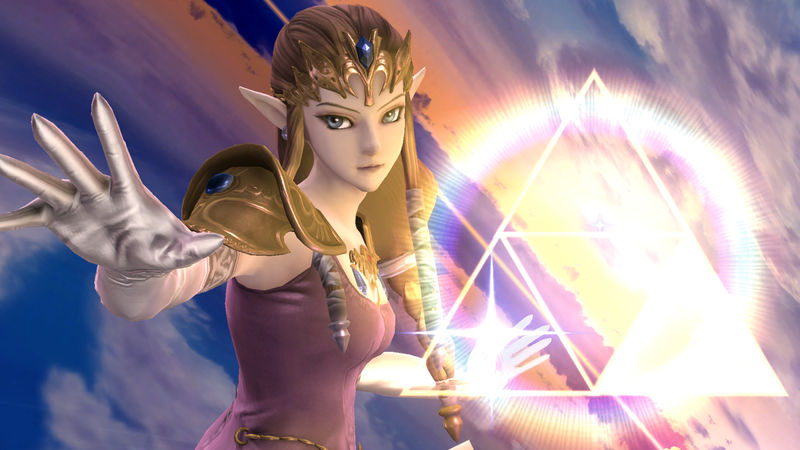 Teach Zelda to use the move to reflect projectiles and guard edges. Din’s Fire is best used as a gimp to intercept recovering opponents. Don’t use this move in any other situation. If you try to use it as an attack, your amiibo could try it at an inappropriate time, leaving herself vulnerable. You only want her using this move as a gimp, and nothing else. Phantom Strike is most powerful if Zelda corners her opponent at the edge of the stage. With proper timing, Phantom Strike can shatter an enemy’s shield. Utilize back throw as a secondary KO move. Compared to other back throws, its strength is above average. Corner your amiibo at the edge of the stage, and throw it towards the blast zone with back throw for a chance of a quick KO. Thanks to Arklaine for compiling Zelda’s information. Images are courtesy of SmashWiki and the official Super Smash Bros. website.